Up in Carthage, N.Y., where a branch of the Rome, Watertown & Ogdensburg from Watertown connects with the Carthage & Adirondack and the line that runs from Utica to Ogdensburg, known formerly as the Utica & Black River - all now and for many years a part of the New York Central system - lives the world’s oldest newsbutcher. (Peat is so common in the United States and Canada that most people can't see the resource for looking at it. There are an estimated 80 million acres of deposit in the continental U.S. Most of this vast natural supply goes unused . . . although some people do throw a few bushels of the muck on their gardens for fertilizer and others use the more fibrous and mossy varieties as a dressing for flowerbeds. 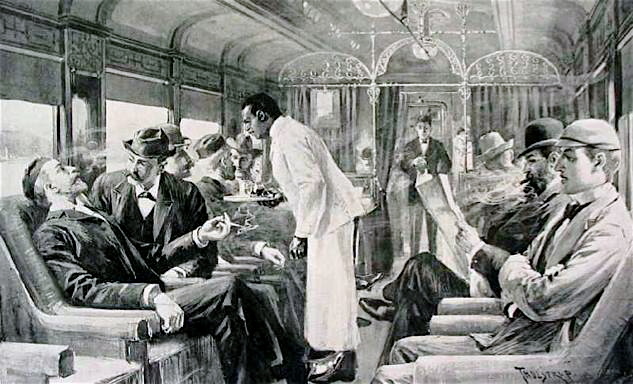 "It is a rather tiresome," said a Wagner parlor car conductor, "the airs people put on in a parlor car. The moment they get seated they begin to behave like kings and queens and to order people around as if they had been used to having servants at their beck and call all their lives. 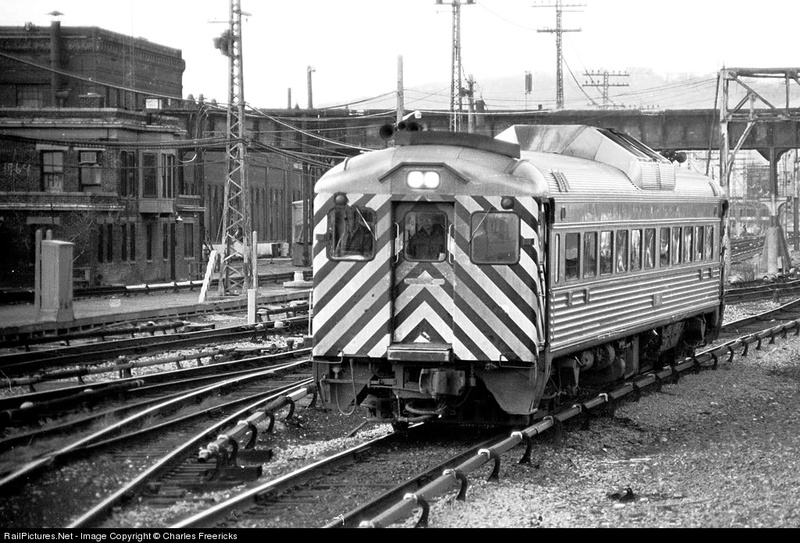 Self-propelled rail diesel cars (RDC's) replaced conventional locomotive-powered passenger trains on many New York Central branchlines in the 1950s, especially on the St. Lawrence Division. This car is shown at Croton-on-Hudson in later years. On the New York Central these were called "Beeliners." Much has been written over the years about the famous Rainhill Trials of 1829, a public spectacle to determine what locomotive was best suited to become the first to be operated by the Liverpool & Manchester Railway in England. This involved comparatively small homemade locomotives. Did the New York Central own ships? Yes, the New York Central at one time owned a fleet of more than 20 package freighters on the Great Lakes through its wholly owned subsidiaries, Western Transit Co. and the Anchor Line that primarily sailed on the upper Great Lakes. 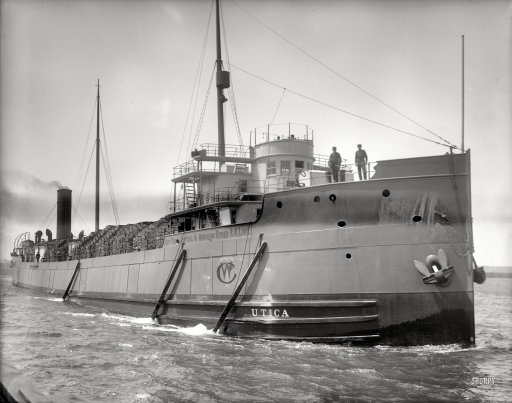 The freighter, "Utica," shown here, was built in 1904 and was registered at 3,533 gross tons. She was 325 feet long and 44 feet wide. The "Utica" was launched April 28, 1904 at Wyandotte, Mich.by the Detroit Ship Building Co.
Trackworkers were referred to as "gandy dancers." 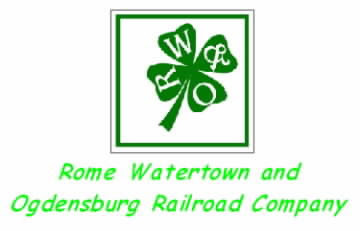 You, who are associated with the railroad and with the people whose business is railroad - especially the operating and mechanical divisions - when you read a newspaper article descriptive of some episode of the railroad story, written by a "penny-a-liner," you are often conscious that it is lacking in realism. It was good, but for some reason a little flat. This is because the writer doe not "speak your language." "I recall it must've been in 1905 when I bought my first round trip excursion ticket to Niagara Falls for one dollar." So said Mr. George Townsend in recounting the earlier years in our town when the railroad played a vital and important role in the changing American scene. Frequently authors become so engrossed in detailed technical information as to what tracks go or went where, locomotive and car rosters, and corporate history, they tend to forget the human side of railroading. Tracks were laid and railroads were operated by people. That's why it's refreshing to occasionally find old newspaper articles about some of these people who made the railroad tick. More often than not, articles of a human interest nature about old time railroads were not written by reporters who had any special knowledge of railroading. But reporters of generations back knew how to ask the right questions, thus preserving for all time a glimpse of how railroads were operated in the early days. One hundred years of railroading, virtually all with the same company - such is the record of the late Pierce Grace of Onativia and his son, Thomas B. Grace of Jamesville. When Pierce Grace died in 1904 at the age of 80, he had rounded out an even 50 years on construction work for the Syracuse & Binghamton Railroad and its successor, the Delaware, Lackawanna & Western. Thomas B. 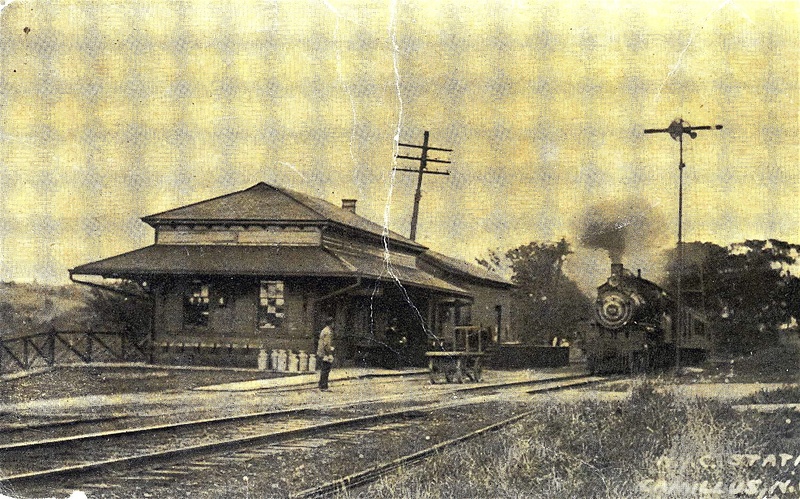 Grace, who learned telegraphy in the days with the dots and dashes were recorded on a strip of paper and who has been an operator or station agent since 1881, has witnessed the growth of Jamesville as a freight station with only a few cars a week until it now ships a greater tonnage per year than any other station in the entire D.L.& W. system. Forty-five years ago the average weekly shipment from Jamesville did not exceed 15 cars. In 1929, Jamesville sent out 32,997 cars valued at more than $1,000,000, an increase of $124,612 over the shipments of 1928. When Pierce Grace landed in America, an Irish immigrant in March, 1848, railroading was in its infancy. The young Irishman had a cousin who operated a brickyard in Troy and he worked there during the summer of 1848, getting a job that fall on the new railroad operating between Albany and Schenectady. Grace was what was called an express runner, but a far cry from the express messenger of today. 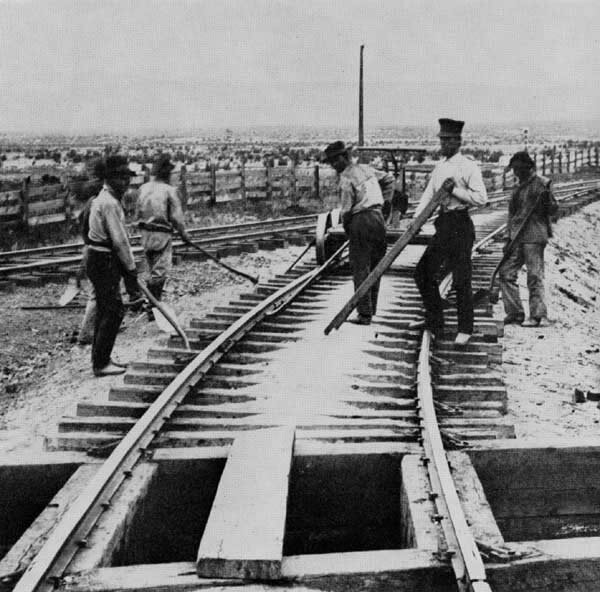 Railroad tracks were constructed of wooden rails with thin straps of iron nailed on the top side. It was no uncommon occurrence for these straps to become loose with the consequent danger of throwing the trains off the rails. So, to ensure a safe passage of the train, a man on a small hand car operated by a crank, was started ahead of the train. 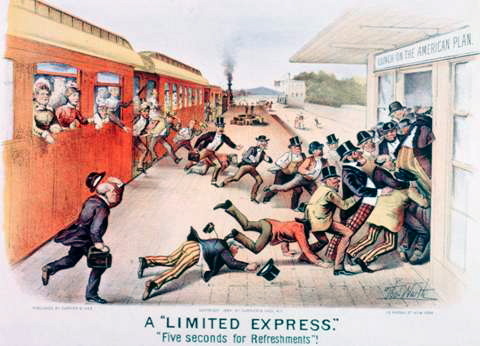 This "express runner" could make upwards of 10 miles an hour and the speed of the train was limited to that of the runner ahead. If a loosened rail strap was found, the runner stopped and the train was forced to halt until the repairs were completed. Each runner preceded the train for five miles when another took his place. After a year on this job, Grace joined a construction gang and soon became so expert in laying track and constructing curves that he was placed in charge of a work train and a big crew of men laying tracks of what later became the New York Central through the Mohawk Valley to Utica and Syracuse. When the superintendent of the New York Central left that road to take over the Syracuse and Binghamton road then under construction, Grace went with him. He was then making his home in Syracuse, having married a Miss Catherine Lonergan, and purchased two lots in Tully Streets at $250 each. On each of these lots he built a small house, lived on one and leased the other. When the Syracuse and Binghamton superintendent drove his construction foreman to Jamesville with a livery rig on June 6, 1854, he neglected to tell him that the former management was insolvent and that the track workers had not been paid in three months and were on strike. There were two gangs near Jamesville, one Irish and one German. Grace visited the German gang first and when the workers learned he was their new boss, one yelled out in German: "Here's our new boss, wait until I throw him into the creek." Now Grace had learned to speak German while laying tracks while laying tracks with German laborers in the Palatinate, and he came right back with: "Some one please hold my coat until I settle with this fellow." The Germans were so surprised to hear an Irishman speak their language so easily, that they offered no more trouble. Grace promised both gangs that, no matter what happened in the past, wages from then on would be forthcoming and work resumed, the track construction was completed and the road opened all the way from Binghamton to Syracuse in October, 1854. The road completed, Grace took a job as section foreman at Apulia, where he remained five years. He had charge of a section 12 miles long, about twice the length of sections of today, and had a gang of 15 men. Pierce Grace bought seven acres of land at Apulia Station and built a house, part of which is included in the present hotel there. A maple tree which he planted across the tracks from the station has now grown to generous size. Irishmen were scarce in the Apulia area and he was a great was a great curiosity, residents of the southern part of Onondaga County traveling many miles to get a glimpse of him. In 1859 Grace bought a farm near Cuyler and gave up railroad work until q873 with the exception of a short time as roadmaster in charge of construction of the last like of the Elmira, Cortland and Northern road between DeRuyter and Cazenovia. * It was on the Cuyler farm that Thomas B. Grace was born in 1865. The summer of 1873 found Pierce Grace in charge of a force of men paving Main Street in Cortland. That same year he returned to the employ of the D.L. & W. as section foreman at Onativia, where he remained until his death. His wife survived him six years, dying in 1910, also at the age of 80. One of Thomas B. Grace's first railroad memories is that of the last wood-burning locomotive on the D.L.& W., which operated a work train. Onativia was one of its fueling stations and schoolboys esteemed it a great honor to be allowed to ring the bell. Grace attended school in Lafayette until he was 14 when he started in to learn telegraphy. A one-room schoolhouse stood where Lafayette High School building now is. Miss Hulda Shaw was teacher. James and Michael Crowe, who operated a store in Lafayette, were his schoolmates. James Crowe later became his brother-in-law. Homer Case was station agent at Onativia when Tom Grace learned the Morse code and how to apply it to telegraphy. Case also served as supervisor of the town of Lafayette. 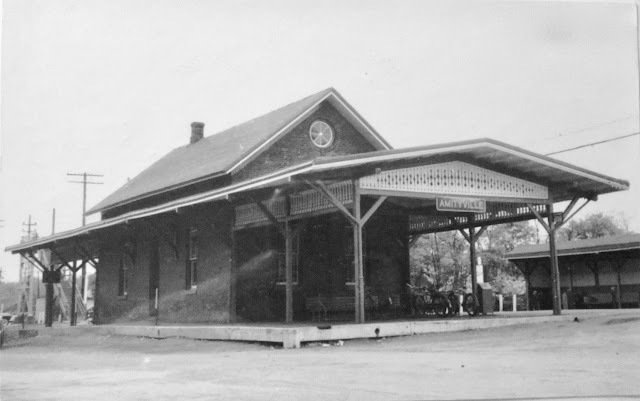 In 1891 Grace became night operator at Jamesville for a year, served in the same capacity in Onativia for three years and then became station agent at Stiles, the station at Long Branch, which has long since been abandoned. In addition to being agent at Stiles he also was postmaster and operated a coal yard until he was assigned to Jamesville as station agent in 1896. He is in his 34th year in that capacity. In Grace's early railroad days, there were no blocks, no semophores, and trains were dispatched by what was known as the single system, with single copies of orders given to conductors and engineers. Extra sections of trains were called wildcats. Passenger coaches were heated by stoves and lighted by candles. Each car was braked by hand and pins and links were the couplers. The Buffalo division of the D.L. & W. had not been built and coal trains were operated through Jamesville to Oswego and western bound coal there placed on boats. The cars were small "jimmies," with a capacity of from six to eight tons each. Jamesville had more industries then, but the amount of freight shipped out was far less than that of today, when the mammoth stone quarrying operations of the Solvay Process Company give Jamesville the biggest annual tonnage on the D.L. & W. System. The bicycle works employed 200 men and made parts for many famous bicycles, including the Stearns Yellow Fellow and Barnes White Flyer Syracuse wheels. I.A. Weston was the inventor of the wire wheel which became standard equipment of bicycles and racing sulkies. Mr. Grace has seen 50 fatalities during his railroad career, not one of which, he says, the railroad was to blame for. Most of them were trespassers on the railroad right of way. Five were killed in a crossing fatality in Jamesville about 15 years ago. Mr. Grace works in the same station house he went to as an operator in 1881. It was built in 1876. Frank E. McCormick, general superintendent of the New York Central, worked in that station. So did Michael C. McGowan, chief dispatcher in New York City, and J.W. Skeels, vice president of the Lehigh Valley. Mr. Grace operated a coal business in Jamesville, being one of the oldest coal dealers in Onondaga County in point of service. He has driven an automobile since 1908, owning the second such machine in Jamesville, a two-cylinder Buick. He has an attractive home, which he built on the walls of a residence erected in 1812. These piles of masonry are as solid as when cemented together with some of Jamesville's own water lime more than a century ago. *Note: The railroad between Cazenovia and DeRuyter was the Cazenovia, Canastota & DeRuyter, subsequently the Utica, Ithaca & Elmira, Elmira, Cortland & Northern, and finally, the Canastota branch of the Lehigh Valley. Thomas B. Grace, of Jamesville died in Syracuse on January 8, 1956 at Onondaga General Hospital at the age of 90. He is buried in St. Mary's Cemetery. His father, Pierce Grace, died at Onativia on March 29, 1915. These engines featured a 14-wheel "pedestal" (PT) or "centipede" style tender which carried 18,000 gallons of water and 46 tons of coal. Like other high-speed New York Central steam power, the Niagaras were equipped to scoop water on-the-fly from long pans set within the rails. The S1s had roller bearings on all axles and also on the side rods and Baker valve motion. The Niagaras had a boiler pressure of 275 pounds per square inch, 25½x32-inch cylinders, and a tractive effort of 61,570 pounds. Their trailing truck supported a firebox with 101 square feet of grate area. This, combined with an evaporative heating surface of 4,819 square feet, produced about 6,000 horsepower at 40 miles per hour, the equivalent at that time of four diesel units. The S1s were fitted with a diesel-like air horn as well as a steam whistle, which sometimes fooled photographers lying in wait for a shot of this relatively short-lived breed of iron horse. Niagaras were last used east of Buffalo on mail and express trains until August, 1953, after which they were used on the New York Central in the Midwest. By mid-1956 they had all been sold for scrap. 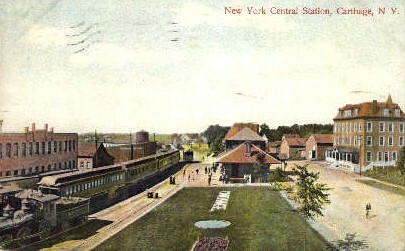 N.Y. Central train arrives in Camillus, early 1900s.